This is where I spend most of my time every single day.....the sunrises and sunsets are an added bonus! Last year, 2015 proved to be a wonderful year, for which I am forever grateful! My online class, "Tinytopia & the Magic of Little Things" was such a fun class and a success in so many ways. I am fortunate to have the most wonderful students who are excited and anxious to try new things....together we explore and create! I learn as much from them, as they do from me. Wonderful friendships and bonds are formed, they are so kind and generous with each other, and every summer we all look forward to another Artful Gathering online event together! 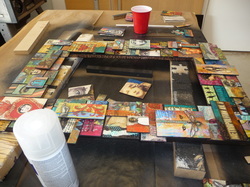 I often participate in workshops myself as we are always in a "learning mode" as artists....how fortunate we all are! Here is an example of some of the houses....we all had so much fun! 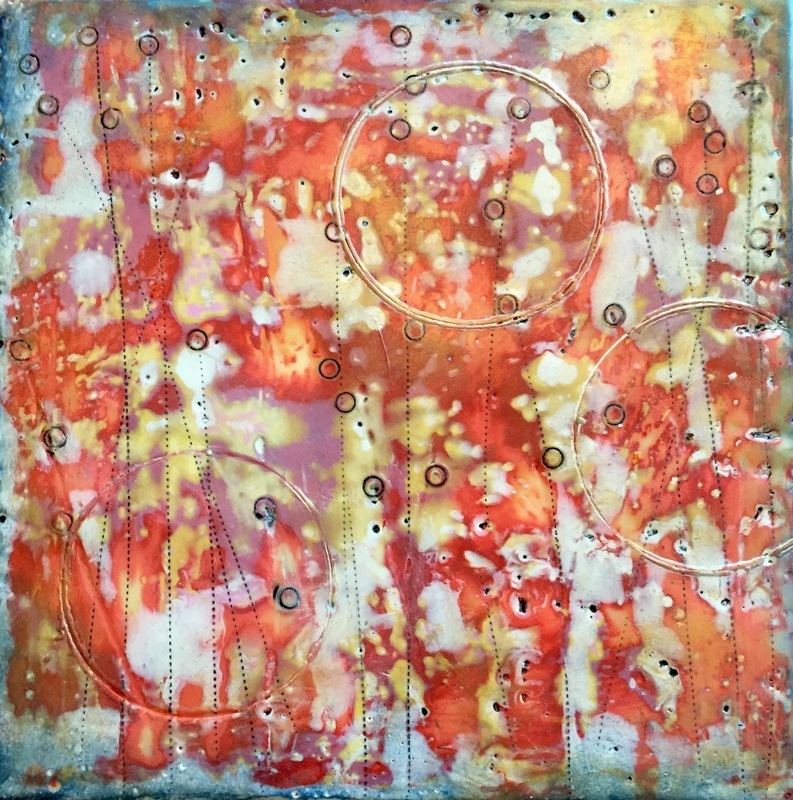 Here is some work that I created in Artful Gathering classes last year in encaustics....I so enjoyed the workshops given by the talented Lynn Belisle and Michelle Belto! By the end of summer, we were ready for a a road trip! 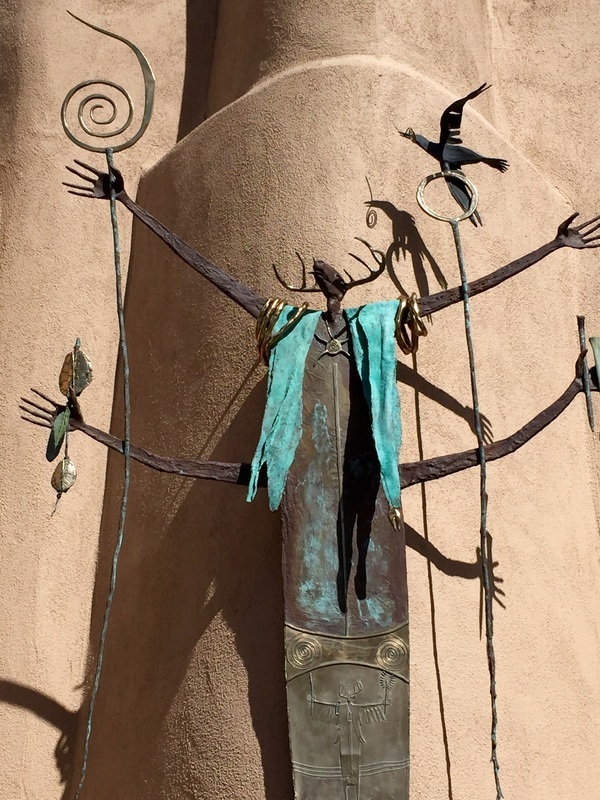 Last October we took a long awaited trip to Santa Fe, New Mexico....what a fabulous town and the perfect environment for an artist! We took our RV and spent three glorious weeks in all that beauty! We got to meet up with friends, do some reminiscing and lots of shopping! If we were ever going to move again, I have to admit that this would be the place....I am even willing to live with some snow again if I could reside there! 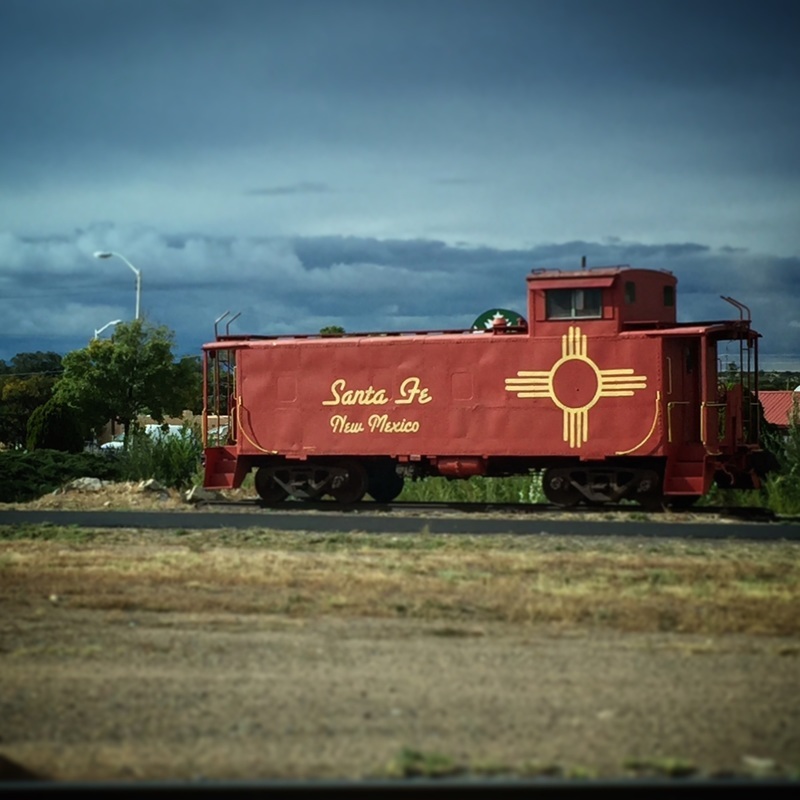 I highly recommend visiting Santa Fe, NM in the fall months....the colors are beyond glorious and that sky is such a deep, rich blue! 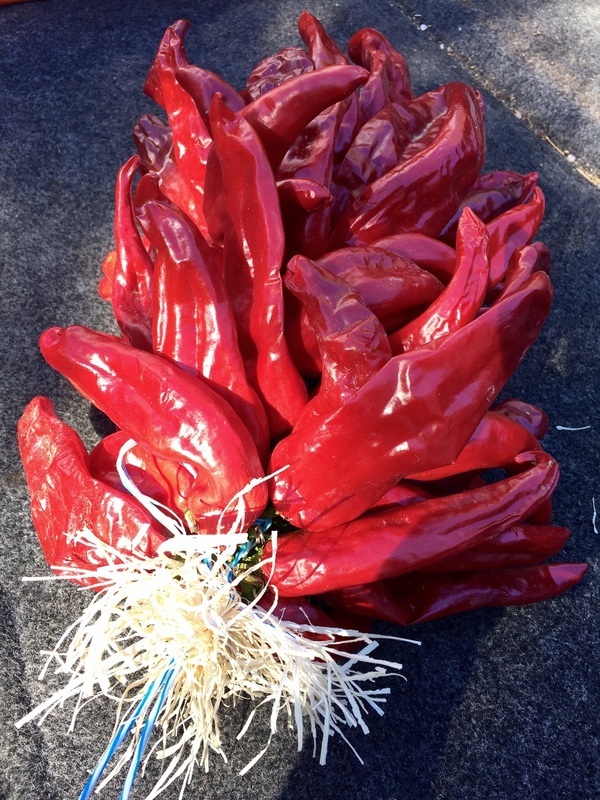 The aspens are turning a golden yellow and the chili ristras are in abundance! November took us back to NY to visit our youngest daughter, Marisa! We are so very proud of her and all she has accomplished! We got to visit with lots of friends and family and although we miss them dearly, we would never move back and leave the southwest! Here we are having a delicious breakfast with our daughter, Marisa.....miss her so much, and some of those wonderful New York eateries, too! Late November and December becomes quite busy for us....we are working on prototypes for the coming years class, in addition to the holidays arriving with all the work and joy in preparation for celebrating! I was able to squeeze in a little time with creating some darling little angels that I not only had a blast with, but they were quite popular, too! So much FUN!! I also had an exciting summer working with the very talented Lorraine Bell! She asked if I would agree to being published in her upcoming book, "The Art of Crayon"! I am honored and so grateful for this opportunity! The book will become available in August of 2016....so excited to receive my copy! So, here I am....now up to date on this site. There are many added photos in the gallery, please take a look if you are so inclined! I am up to my eyeballs in working on this summer's class which will be revealed sometime in February! I will be sure to put a shout out here when it happens! Thanks for taking the time to read this post and look forward, perhaps to hearing from some of you soon! Here is a "sneak peak" of what is coming this summer in my new class.....hope to see you there!! 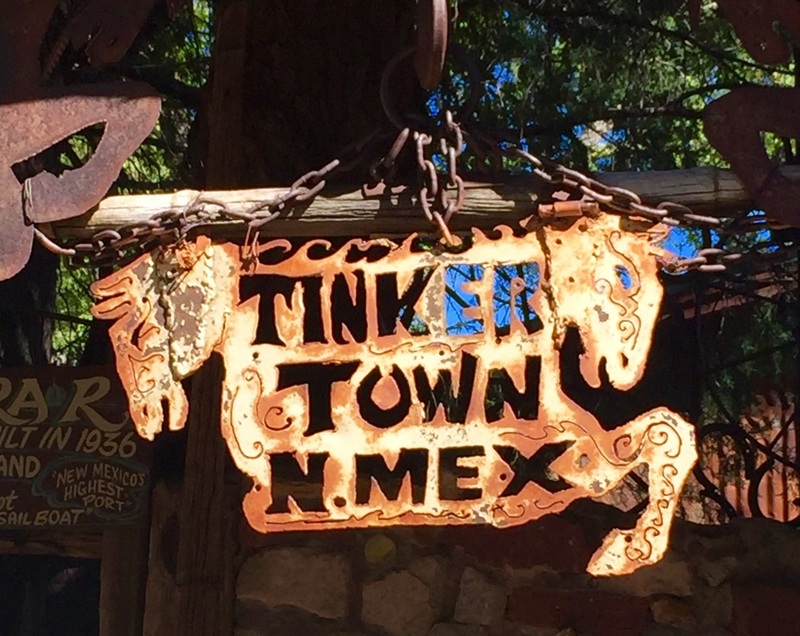 A sign we discovered in Tinkertown - a fabulous folk art museum! 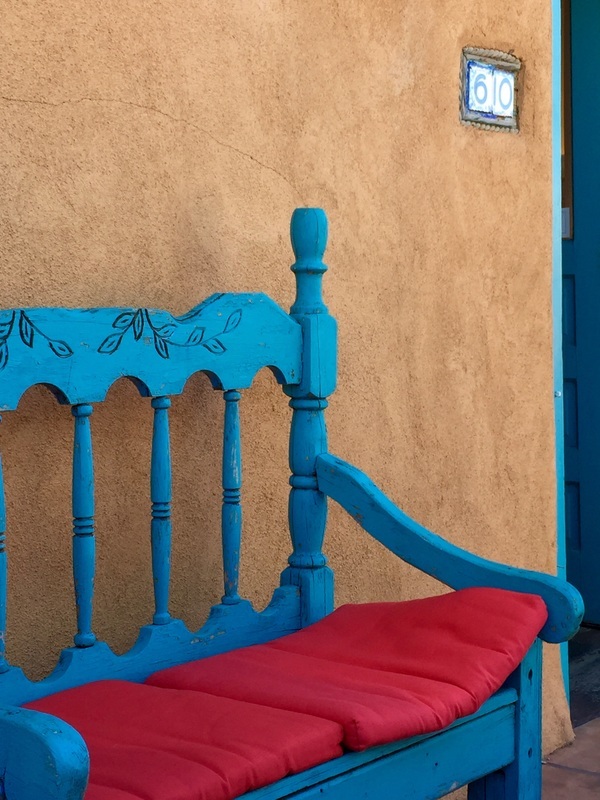 Located on the Turquoise Trail, Sandia Park, New Mexico....I would highly recommend it! 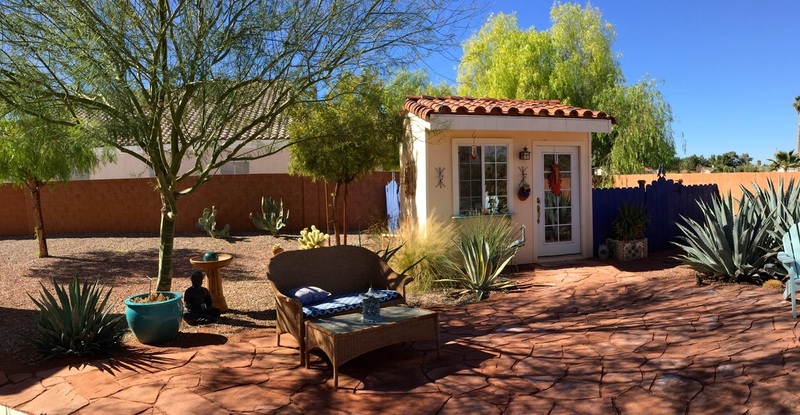 I have two studios, one inside my home and another outside on our property....I love spending time out there every single day. Last summer I worked on various projects, which I will get to in a bit. 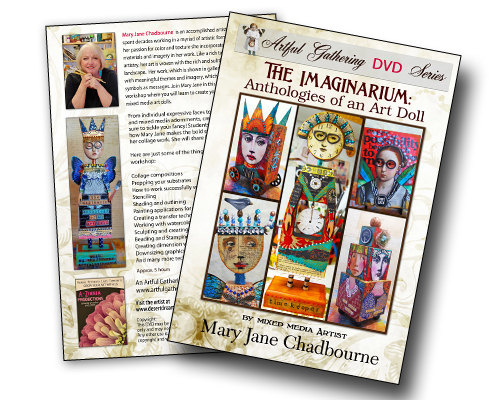 My main project was teaching my online class, "Imaginarium - Anthology of an Art Doll" on Artful Gathering. It was a huge project, the class was five hours long in duration and I had a record number of participating students! As an artist and a teacher I was amazed and thrilled to see the wonderful work created by so many students! Each doll unique in it's own right, just as we are all individuals and unique...it sure made my summer a pleasurable one and will hold those memories close to my heart forever! I saw friendships being formed by many and there was a wonderful camaraderie that existed amongst all of the students in the workshop which made it even more special....the stuff dreams are made of! Our donation made up of scraps of wood and ephemera I had leftover in the studio from other projects. The fall brought some fun things in store for my husband Jim, and myself! A wonderful trip to Disneyland with our daughter, son in law and twin grandsons who were celebrating their fourth birthdays! A whirlwind of fun and excitement packed into two days....so much fun and being grandparents is truly a gift beyond compare! On our return home I unfortunately came down with a horrid case of bronchitis and was sick on and off right up until the holidays....not.fun. In between we were able to create a wonderful donation to ALS of Nevada's Annual Art Fundraiser....the piece you see above is a true labor of love. We collaborate on many projects together and this was a result of one of our latest! I want to make more of these, but finding the time is becoming increasingly more difficult. A gallery where I show my work would love a few of these and perhaps it will come to fruition...time will tell. I have an affinity for cloches! Here is a simple ghost I made from cheesecloth and spray starch! I love the holidays, especially Halloween! 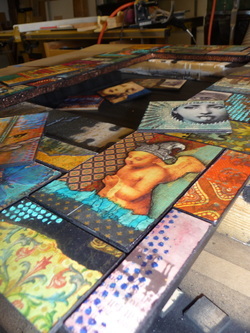 These are just a few samplings of what went on in the studio late summer and fall of 2014! A much anticipated trip to Sedona, AZ...one of our favorite places had to be cancelled due to the tenacious bronchitis I was dealing with. 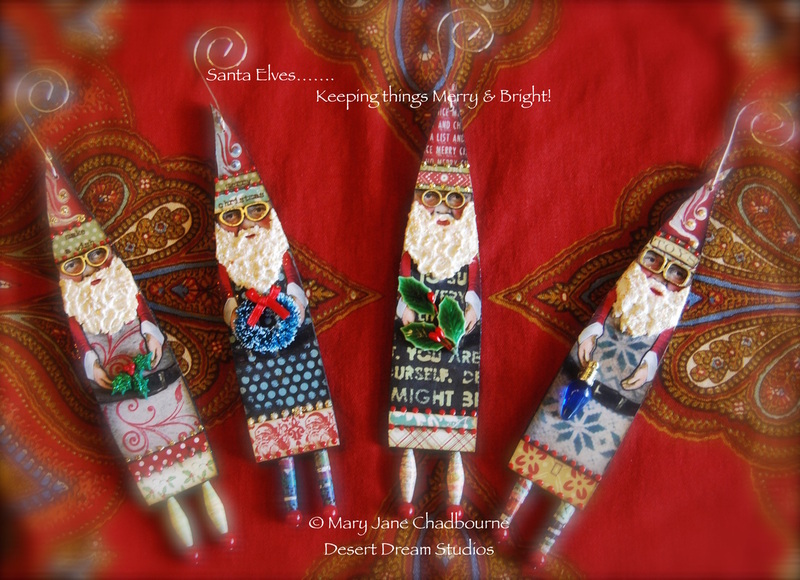 But I sure had fun creating my little Santa Elves in the meantime....see below! I work on ideas for teaching an online class almost a year before it comes to fruition. There is a lot of work involved on the idea itself, if it is feasible (which most ideas are) and the planning and prototyping, experimenting and designing....Jim, my husband is a master woodworker and we work well together on designing ideas that we think will work for a workshop....this past year I have been thinking real "tiny"! I had been seeing a lot of little art houses on Pinterest (one of my favorite places to peruse), tried a few and I was hooked! Then the real work starts of coming up with an idea and having it evolve to where I am happy with it. And that is when I knew my next class had been born, "Tinytopia and the Magic of Little Things"! I am fortunate to have a talented craftsman to build me just about anything I may need or want....so I can specifically design something exactly how I want it....grateful is my mantra, for sure! So many different techniques and projects will be in my new class! This is created on canvas....there is more than one way to create your own little Tinytopia! It's time for me to get into the studio today....I have lots of work to do in preparing for my newest class. I do hope you can join me this summer on Artful Gathering, and I look forward to seeing you there...our summer's spent creating are always the most enjoyable...full of new discoveries, learning new techniques, sharing and for many a whole new world opens up! I love teaching a workshop and am looking forward to this coming July with great exuberance....please join me in a whole new little world, a world that you will create that will be all your own! The last year or so has been a series of collaborations for me. First and foremost, working with my dear husband Jim on the dolls that he is tirelessly preparing for my upcoming class, "The Imaginarium - Anthology of an Art Doll"....I will often come to him with an idea that I have in mind, never knowing when I present it to him if it's even a viable idea...but an idea nonetheless! I don't know the first thing about woodworking, that is totally his specialty and he sure is great at it! We worked tirelessly on this project, over many months, trying out many prototypes until we came up with designs that we were totally happy with! He is not only very talented, but very patient, too....we were away in Palm Desert, CA for a good part of the winter with our RV....and I dragged cartons and cartons of supplies with us....because I knew I had to get this "just right"....I am happy to report that all the hard work has paid off and we are extremely pleased that the final creations are exactly what I was looking for! So many students had asked me to teach a class in dolls, and I am so thrilled to finally be able to present it.....thank you Jim, for all of the hard work and support you give me....without you none of this would be possible! Hanging out with some of the "girls"....waiting for the class to begin! 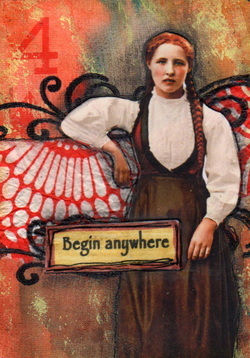 Although I started out with just dolls....it has now expanded into using artist trading blocks, or "chunks" as they are sometime referred to...these are immensely fun, and like artist trading cards often provide not only a fun creative outlet, but will often give an artist an idea for a larger piece! The wood pieces are readily available for your local home centers...most will make the cuts for you if you ask. It was important to me that the class be as diverse as possible....not only utilizing many different techniques, but utilizing different types of substrates, too! These are so much fun to create, just like the dolls! Another collaboration I had the pleasure of partaking in, was with Sandy Gordon, a fabulous graphic artist whose work I have been using for years. I was hopeful that when I approached her about this project that she would want to participate, and she graciously accepted! The kit she custom designed for this class is beyond spectacular....all of the imagery you see here is from this talented artist...I cannot thank her enough for working with me....tirelessly, over many, many months until we had exactly what we were looking for! You can visit her Etsy shop here and believe me when I tell you that you will enjoy visiting her beautiful graphic work! Thank you so much Sandy for all the work and long hours you put into making the kit as wonderful as it is! One more person I must thank from the bottom of my heart, is my dear friend, Cristina Zinnia Galliher. Without her, there wouldn't be an Artful Gathering, nor would I have never taken it upon myself to ever think about online teaching online! Her tireless efforts, support, encouragement and advice has been instrumental in me even taking on projects like this. And I am sincerely honored to be a part of such a wonderful online venue....the best one out there in my opinion! Zinnia's vision continues to grow and with that each year, Artful Gathering becomes an event that surpasses itself in every single way possible. Thank you for being you, Zinnia! I expect to be very busy for awhile now....so with that I wish each and every one of you a wonderful summer, and a wonderfully creative one, too! 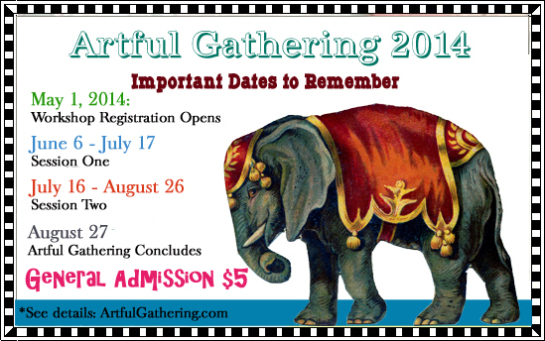 Hope to see many of you over at Artful Gathering and what a great summer it's going to be for us all! Birthing an Idea.....Creating a Class! Oh dear, it has been a very long time since I have visited here! I have a confession....I rarely blog about my work and my talented husband, Jim's work because I would rather be making art, than talking about it....unless it's about teaching it, that I could talk about for hours! Jim built this studio for me when we first moved to Las Vegas six years ago! I'd like to think that working on house projects for many years has brought us to this wonderful place of working and collaborating on projects that involve my teaching...I never thought I would love anything more than creating art just for the sake of creating it, but think teaching it is equally as enjoyable and important to me! Being able to teach others, help them spark their muse (because we all have one, whether we know it, or not) has been the most fulfilling experience and I wouldn't trade it for anything else in the world! There is no better feeling than taking a student to a place they thought they might never be, or taking someone to another level....and I feel so very blessed to have this opportunity and love every single minute of it...and I learn and grow right along with my students....a true gift from the universe! 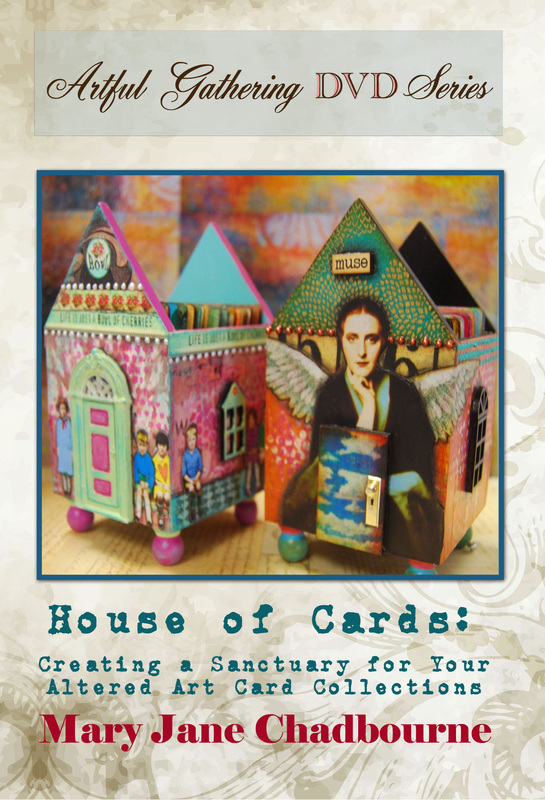 So, without further ado, I am introducing my new online class for Artful Gathering for this year! Here is a sampling of "the girls".....over a year and a half of hard work, growth and finally coming to a place that feels just right! These are so much fun to create and look forward to teaching and creating with you all...these are just the first prototypes and the possibilities for these will be endless....mixing and matching with all sorts of techniques...each one telling their own story and I can't wait to show you more....stay tuned for more pictures and surprises about the class....and in the meantime, Jim and I had better get back to work....we have a lot to do! 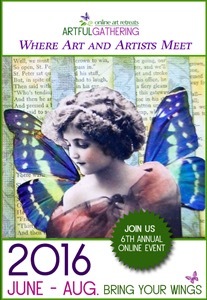 Artful Gathering Event Registration is Open! 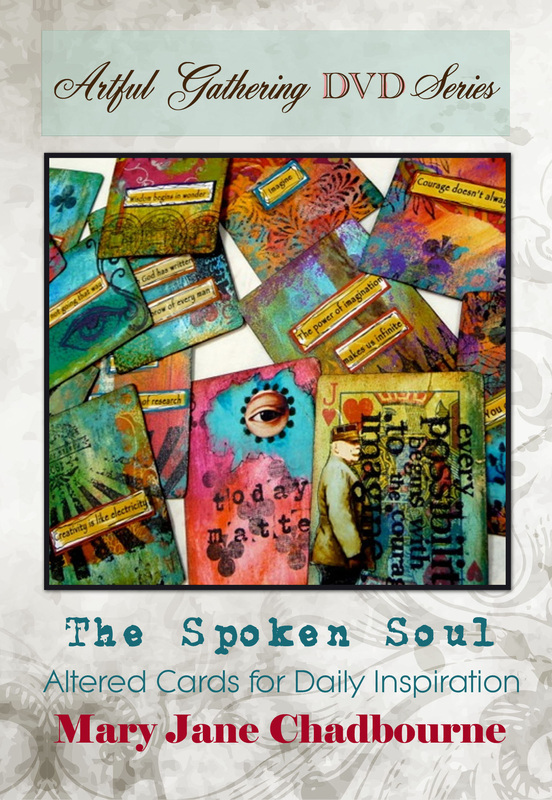 I'm the Spotlight Artist for The Artful Gathering 2013 Blog Hop! $200.00 Gift Certificate for The Artful Gathering Marketplace Opening Soon. The winner can apply the certificate toward any 2013 online art workshop(s). *kits and dvds not applicable. Online at Artful Gathering 2013! If you would like to hop with us and meet all the super awesome Artful Gathering 2013 Art Instructors, and have a chance to win a random drawing prize in our random drawing, then hop with us! Each week, I will announce the blog for you to visit, and off you go to meet them, and to pick up the newest secret word. For your chance to win, you must collect all the secret code words and submit them upon the final destination blog in May. A random drawing will be conducted from those participants who have submitted the complete collection of secret words! Next week, I'll announce the next person to hop to. Good luck!!! It often surprises me how fast time really does speed by...and seems that the older we become, the faster it goes! I have to admit right here and now that I am very behind schedule with blog posts....not that I don't enjoy working on them, but it seems that it's just more time spent on the computer and less time spent in my studio where I really want to be most every single day! But with a new year comes new resolutions and I do hope to be here more... and I thank those of you who do follow my work for sticking by me, even with my lack of blog posts in the past! Our winter here in the desert southwest has, for the most part, been colder than normal...there were mornings where our pool has actually frozen over around the edges...something we have never experienced in the five years we have lived here. This is not something that thrills me...one of the reasons we left New York permanently...because of the cold, snow and ice! I know, still a far cry from a "real" winter, but nonetheless made it rather chilly for us "desert rats", which now my husband and myself consider ourselves! With the new year also came lots of projects...some finished and many just beginning! 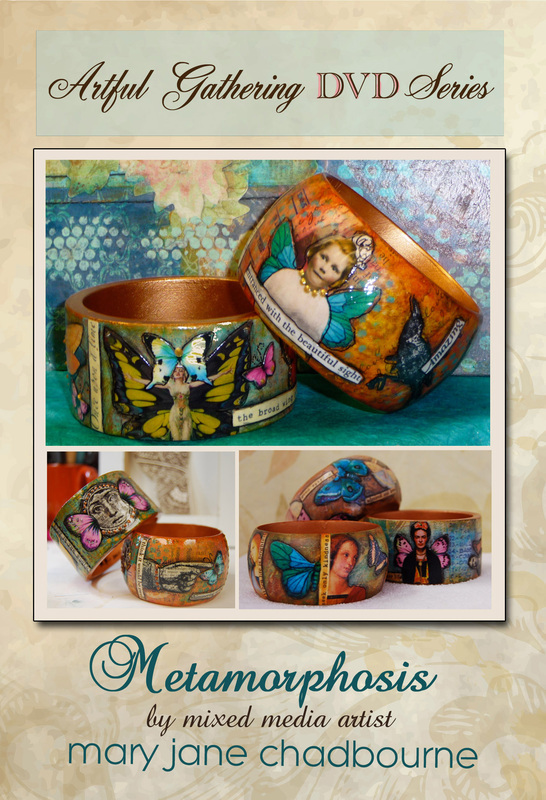 Last year I taught my first online class "Metamorphosis Collage Bracelets" on Artful Gathering 2012. I had such a wonderful time and so many students...no one could have been more surprised than myself! I was in awe of the work that my students produced and a whole new world opened up for me...the love of teaching others! So this year I have decided to teach two classes online at Artful Gathering. A lot of work, but so fulfilling as an artist and a teacher. Every single instructor is so talented and all are so very supportive of each other....an unusual thing to find and I am so very grateful for the opportunities that have come my way. I first discovered these altered playing cards through a swap last fall and I was instantly hooked! A fun and ingenious way of taking a simple playing card, altering it and adding a favorite quote, word or phrase....I often need and appreciate daily reminders to myself of some of these...a gentle prodding, sometimes a word of comfort, and often an inspirational phrase is just what's needed in my day....I am thrilled to offer this class and look forward to sharing it with others....there should be a law about having this much fun! 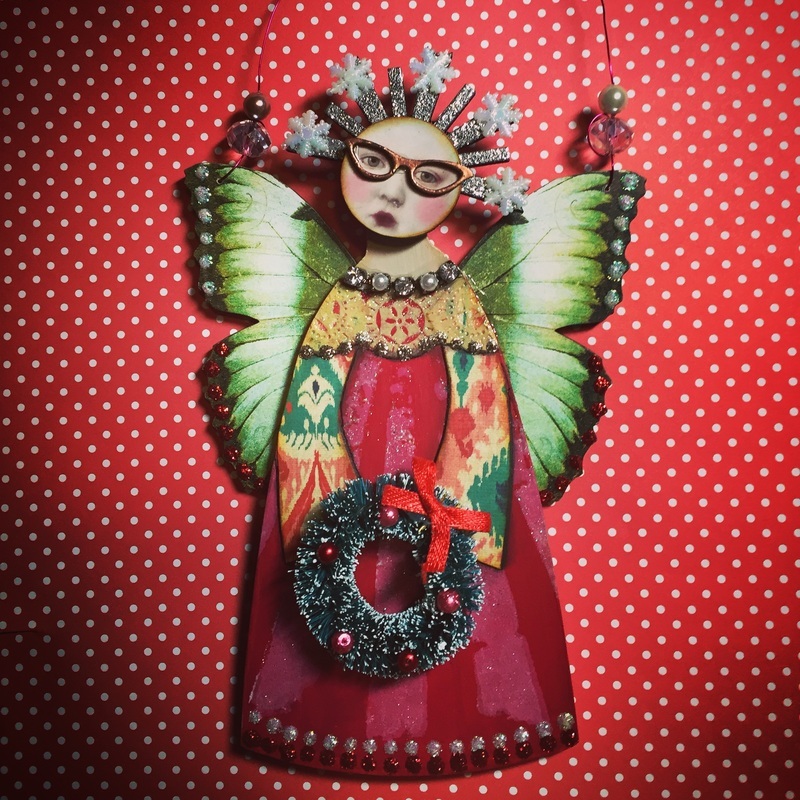 Here is an example of the other class, "The Art Doll Chronicles"....this idea came to me last fall and had it mulling around in my head since then and right through the holidays. This required vast amounts of time working on prototypes, and getting them "just right". My husband Jim is not only a fabulous husband and partner, but an accomplished woodworker and we worked side by side on these, working out any problems and kinks in the development of these dolls. I am happy to report that we have accomplished our task, after many months and he is busily cutting the pieces and getting them ready to sell as kits which will be an accompaniment to the class! Three different styles of doll will be taught and I must admit that although they were so much work to develop we are ecstatic with the results and think the students will be, too! I can't wait for classes to begin....not until June and I have a lot more work to do before then. Filming begins very soon on both classes after a short break to take a much deserved breather.....in the meantime I have other work to catch up on and some work for The Urban Ranch General Store here in Las Vegas....she soon will have an online catalog which will be fantastic for the people that don't get to shop "in the flesh"! Before we know it, spring will be upon us and we will be as busy as the bees....in the meantime I hope to be more productive here and to keep you all caught up on the current events of Desert Dream Studios! I am amazed that summer is over and we are now into autumn. 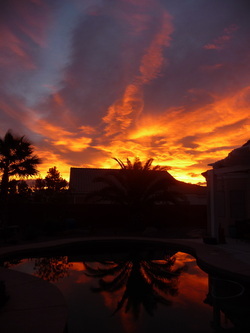 Although I would hardly know it if it weren't for the calendar staring at me....we had a very HOT summer with a lot of monsoonal moisture added to the mix that made it humid here in the desert southwest...something we don't experience too often, thank goodness! Am glad to see autumn arrive even though our temp's have not reflected the change of seasons yet....but hoping for that real soon...I look forward to having the fireplace blazing, cooking soups and stews on the stove and baking too! And all of the wonderful holidays to look forward to with friends and family. I have been busy most of summer with teaching my very first online class on Artful Gathering 2012, which I am glad to report was a huge success....so much fun and I was amazed at all the wonderful work that was created by the students! Between teaching and working in the studio my summer was chock full of work. A trip to Santa Barbara was cut very short due to a scratched cornea (ouch! ), but we got to spend time with our precious grandsons and various projects around our house kept us plenty busy too. I am currently working on some creations for Dia de los Muertos, or better known here as Day of the Dead....there's lots more on my worktable in the studio that are waiting for my attention, too! For the past few months my husband Jim and myself have been working on a joint project for a donation for ALS of Nevada. This is one of our favorite charities that we always like to donate to for their annual Art Wreath Festival that will be held this November. It raises much needed money for their organization and we are always so happy to be able to participate in this event. Many people in the Las Vegas area donate the most beautiful and creative pieces...ours will be just one of many that will be donated. People are very generous with their time and talents here in Las Vegas! 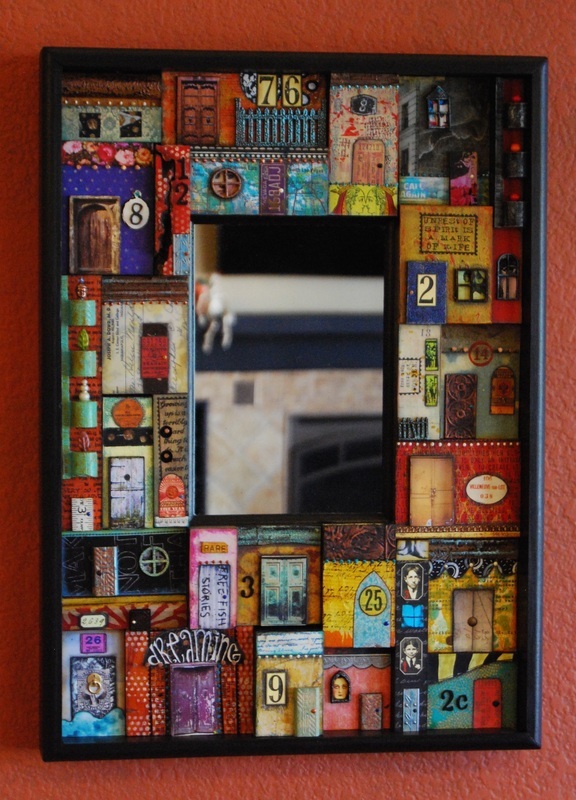 "Curious Anthology" is approximately 2' x 2'...comprised of 32 small shadowboxes that were individually cut out and put together by my very talented husband who is a woodworking genius! I then created small vignettes, or for a better word, stories...the graphic pieces are cut out multiple times so that they appear dimensional...a painstaking process that requires a lot of time and patience. The wood pieces are made from scraps and there are also a lot of vintage items and artifacts added to it. I am into anything that can be recycled! I want to note a special "thank you" to Marsha Salyer Jorgensen from Tumble Fish Studios for so many of her wonderful graphic images that I used. She knows I am one of her biggest fans and am always thrilled to use her masterfully redone digital images whenever I can....thanks Marsha! If you go to the Gallery section at the top of the page here you can see the works photographed individually and close up. I will be sure to mention here in a blog post when the auction takes place and hope to post pictures of some of the other wonderful wreaths, too! I have made this post longer than I had originally intended. I hope to post some about a class I am taking starting next week with a wonderful teacher here in Las Vegas...Joyce Straus. I love her to pieces, she is so multi talented and I can't wait to see what we are going to be creating! Every Tuesday morning I am going to be in heaven for the next eight weeks...maybe she will let me take some photos and I can share with you all here...have a wonderfully creative day and enjoy your weekend! We just returned from a week away with the camper up near Zion National Park in Utah. So good to get away and we are fortunate that we live only about two and half hours away from this stunning area up in Utah. Pristine vistas with unbelievable rock formations. It never ceases to leave me speechless and in awe of it's beauty, no matter how many times we return there! We only hiked one day as the temps were higher than normal (90's) and there is always plenty to do up that way...it was great getting away, but also good to come home. This summer is going to be a busy one for us and so we were glad to get away with some R & R! As I posted last in January many artists in Las Vegas were given these 16" diameter hearts by the local chapter of St.Jude Children's Hospital to create artwork on. 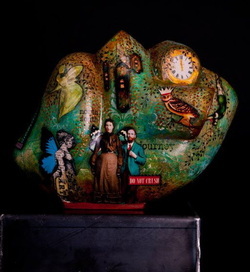 Some artists took on the larger hearts which are 5' diameter. These all went up for auction at the Gala Event at the Four Season's Hotel here in Las Vegas just last weekend. This is my piece which was created in a mixed media collage....I loved making it and considered it an honor and a privilege to have participated. It is such a worthy organization and I will do one every year, if asked. This organization treats children with cancer and catastrophic diseases whether they have insurance, or not...a pretty noble endeavor and cause, for sure. I still have no word on what the piece sold for, but am sure it is more than I could have afforded to give them, so this is my small way of helping out....and my pleasure, indeed! About a month ago I had a friend come to Las Vegas for a visit....we had met on Facebook about a year ago. Her name is Kristin Hubick and she is not only a fabulous person in her own right, but also a fantastic vendor who owns Retro Cafe Art Gallery...an online supplier of the most wonderful supplies for artists and crafters. You can find the link here. I can't tell you how many terrific things I have purchased from her and her service is top notch, too! While we were having lunch, Kristin presented me with a gift she had made for me. I was not only surprised by her lovely gesture but upon opening it I was deeply touched....she had taken a photo of the heart that I had created and made an absolutely beautiful charm out of it on a necklace! She remarked "I know that you donated the heart to St.Jude's, but wanted you to have it with you forever". Seriously, I thought I was going to cry....I don't think I have ever been so touched by anything that someone has made for me! On the other side is this touching quote by George Sand....how perfect a quote is that for this piece?! I will treasure this forever and thank you again Kristin, from the bottom of my heart, I will treasure it always. Not only is Kristin Hubick a great shop owner, but a very talented artist in her own right, and I am so glad we have become friends! 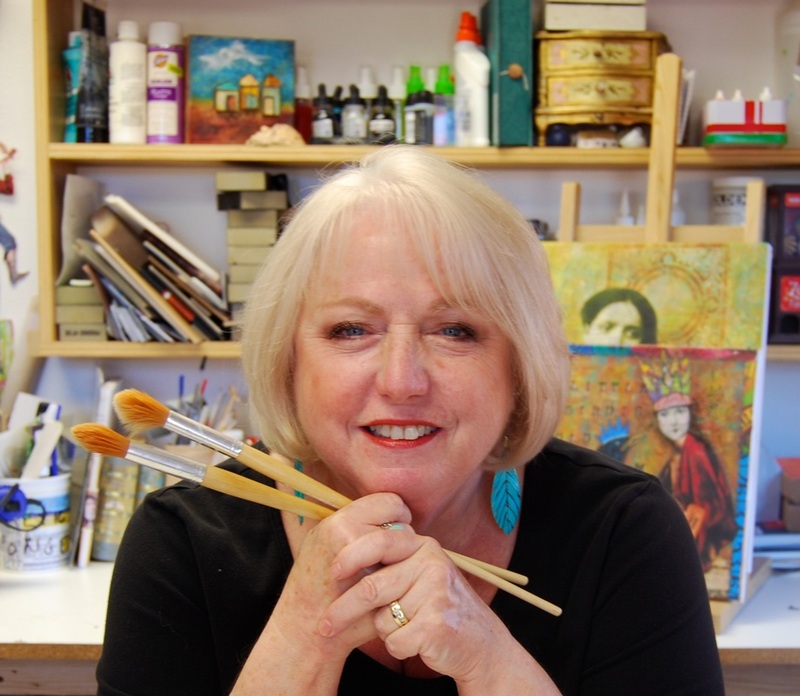 Online classes at Artful Gathering! As many of you know, and for some who may not know, I am teaching an online class this summer on Artful Gathering 2012......you can find the link right here. I am teaching a six week class titled "Metamorphosis Collage Bracelets". I am so very excited and can't wait for the classroom to open up on June 6th! I am looking forward to meeting my students and getting to know them better...I love to teach others and this is the perfect opportunity for me to do so without having to leave home and go to the expenses of travel and lodging....and the same for the students, too! Six weeks of 24/7 classes, in the comfort of one's own home....what could be better than that?! I will be available every day to answer questions on the videos and guide them every inch of the way. It is important to me that they not only learn the techniques, but enjoy themselves while learning....after all, that's what it's really all about! There are many other class offerings also....all fantastic teachers with wonderful talent! Awhile back I created a promo video that tells a bit about the class and gives you a glimpse into my wonderful studio....I will post it below. Registration for the class is still ongoing...it's all very exciting! Here are a few examples of what I will be teaching in the class. These are so much fun to create, I have had much success with them in the galleries and want to share what I have learned with other artists. These two bracelets in particular will be raffled off to two students before the class is over! I will be posting again as the class begins to share my experiences with you all....wish me luck and I am so excited and very grateful for this experience that I know will prove to be wonderful! I have a wonderful recipe for Buttercream Icing! Well, where the heck did December and January go?! Here we are at the last day of January 2012 and I am scratching my head and wondering about it all! I often feel as if I could use at least a few extra hours in the day, as I am sure most of you do! I guess I shouldn't be complaining about it. Being busy with projects is a good thing! 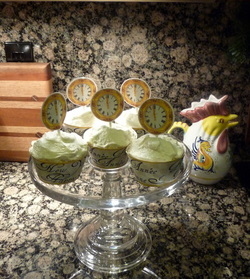 Here are some delicious cupcakes I made for a New Year's Eve party we were attending. I just love the little clocks hitting midnight along with the liners that say Happy New Year in French and in English....You can find the vendor here! 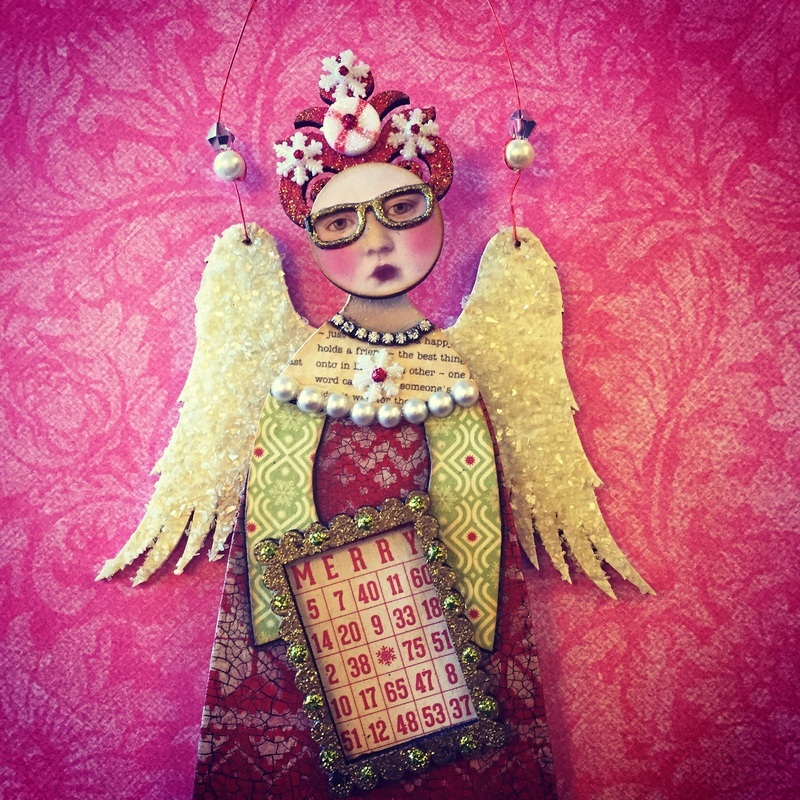 She has the most wonderful things in her Etsy shop and she is very prompt with sending the digital files, too! I am fortunate that I have discovered so many wonderful graphic artists on Etsy....maybe at a later date I will make a link to all of them. The video above is a wonderful little synopsis of The Hearts of Las Vegas Art Project that is currently in full swing now! It is an annual event and it raises money for the St. Jude Children's Research Hospital....a wonderful and worthy organization that does research to find cures and treatment for children with cancer and other catastrophic diseases. St. Jude is the only pediatric cancer research center where families never pay for treatment not covered by insurance, and families without insurance are never asked to pay. I am honored and to have been asked to create a small heart (16" in diameter) to donate for this worthy cause. Once completed, each heart will be mounted on a granite base to be displayed at the Affair of the Art Gala in May at the Four Seasons Hotel here in Las Vegas. These hearts will go up for auction and will raise much needed money for this great cause. To the left is a quick shot of the heart I am working on. As with most everything else these days, this will be made up of collage with a bit of mixed media thrown in for good measure! I am finding the heart challenging, but at the same time I am enjoying the work immensely! I am such a firm believer in this. You never know where a possibility can take you....and if you don't grab it when it comes your way you will never get the chance to find out! That's how I felt when I was offered to teach an online class this summer on Artful Gathering 2012....here is the link. I will be teaching the class "Metamorphosis Collage Bracelets" and am so excited about the idea of teaching this technique to others! The bracelets have been received well, I have sold quite a few and am anxious and thrilled to teach this to others...I have taught a few classes in person, but the online genre for teaching is a whole experience for me....I must say I am enjoying myself and have learned a whole lot more than I ever imagined about camcorders, filming and editing! The project is in full swing now and my class begins in June which is the very first session! I have begun filming and am a lot more comfortable in front of a camera than I ever thought I would be! A huge thank you goes out to Cristina Zinnia Galliher who runs the entire Artful Gathering and also Roses On My Table....you can find a link to that right up on the right here on my blog sidebar....please join me for this wonderful event! ALS of Nevada has a Wreath Gala Silent Auction this coming Thursday....for those of you who are not familiar with ALS it stands for Amyotrophic Lateral Sclerosis. A disease of the nerve cells in the brain and spinal cord that control voluntary muscle movement...better known as Lou Gehrig's Disease. There is no cure. I became aware of this chapter last year, when they held their First Gala Wreath Event and was honored when I was asked to create a wreath for their auction. 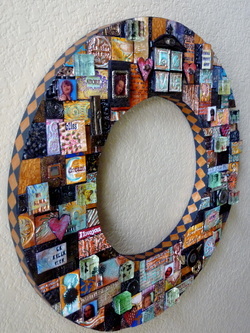 Here is a photo of last year's "wreath"....made entirely from polymer clay tiles that I had created and some little glass tiles that I had placed images behind. They were happy with the wreath and it did raise some much needed money for them....I wish I had taken photos of some of the other marvelous creations that people donated and will definitely do it this time, for sure! Now, for some reason I am always hung up on the "wreath concept"....I don't know why. I ponder this all summer and go over idea after idea in anticipation of the upcoming project....at first I had thought of doing a wreath entirely of little tiny jigsaw pieces that I had collaged...it wasn't long until I realized that the wreath would never be done in time...so I filed that idea (and the tiny pieces already completed) away in my head and in my studio for perhaps another project down the road somewhere. So onward I proceed with another idea that entailed cutting up many little squares and rectangles to collage onto......I must add here that my husband is not only so very supportive of all of my artistic endeavors, but also an integral and necessary part of many of my projects. He is an accomplished wood craftsman with many talents and we often collaborate on a project that presents itself with special needs....such as measuring and cutting. So he creates a square base for the "wreath" and cuts me what seemed like a billion pieces in varying sizes of square and rectangles from melamine board bought at the local Home Depot (4' x 3'...very inexpensive) and I proceed to gesso each and every piece to give the paper "tooth" to adhere to the little squares...I collaged different backgrounds and images to each with matte medium and also applied graphite and pen and ink to the images to create depth....have to admit that what seemed like it would take me forever went along very swiftly.....when I am engrossed and loving what I'm doing the time seems to fly by! Here is the completed wreath....there was a lot of sealing going on with the finished pieces, then glued in two different layers and two different heights. I am pleased with the result....this is titled "Six Degrees of Separation" to signify how we are all linked to most everyone else in this world. Thought it appropriate for this particular fundraiser.....we are all connected, no man is an island and what happens to one individual in some way effects us all, don't you think? I hope it raises them money that is so direly needed for the patients and their families. It gladdens me to no end to be able to donate this to them! So Thursday, November 10th is the event....we look forward to this so much. Last year's was beyond fabulous....great food, live music, wonderful people and such wonderful art in the form of "wreaths" to observe, discuss and bid on! Most everything is donated for the event which shows me how generous and caring so many people are! I will be sure to take pictures this time and post here at a later date....I hope you enjoyed this post a bit....I am enjoying working on the blog more and more as the time passes and I get to know my way around here better. Goodnight and will be returning with another post about the event and with some pictures for sure! 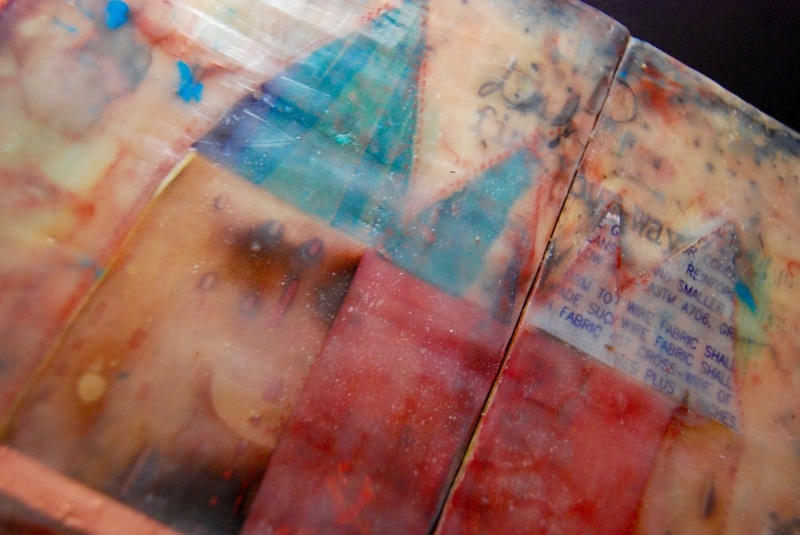 I am a full time mixed media artist who resides in the desert southwest. I love to create, teach and share great finds with everyone....this is what I hope to achieve with this blog.